Looking for more Mexican options? Burlington and Stowe each has a locally focused, $25 menu to choose. Burlington's El Gato Cantina serves braised Vermont Family Farms pork belly, Misty Knoll Farms chicken mole and even Sheffield Seitan burritos to keep locavores happy and full. Still, they should leave room for banana flautas or tres leches cake. Dinner at Frida's Taqueria and Grill in Stowe begins with sea bass ceviche and continues on to a platter of braised local goat, followed by a choice of dessert. The $10 lunch special features tortas on freshly baked bread, with fillings ranging from crispy fried chicken to marinated mushrooms. 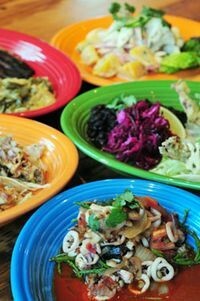 To learn more about El Gato Cantina or to see the full menu, click here. To learn more about Frida's Taqueria and Grill or to see the full menu, click here.